I have changed my page on tai chi to reflect the fact that I am now certified and plan to start teaching Tai Chi for Arthritis. This a Sun style form, as opposed to the Yang style I am used to. It emphasizes gentle curved movements in comparison to the more linear style of the Yang forms and an open and cupped hand, frequently with a bent wrist rather than the “beautiful lady’s wrist” of the Cheng Man Ching style I have been doing for 40 years. I like the form, which includes qi gong moves and was adapted by Dr Paul Lam, an Australian doctor, to help people with arthritis. It has impressive credentials, starting with an endorsement from the American Arthritis Foundation, and the Center for Disease Control. And a teaching philosophy which makes it much more accessible. I think I’ll give it a try! 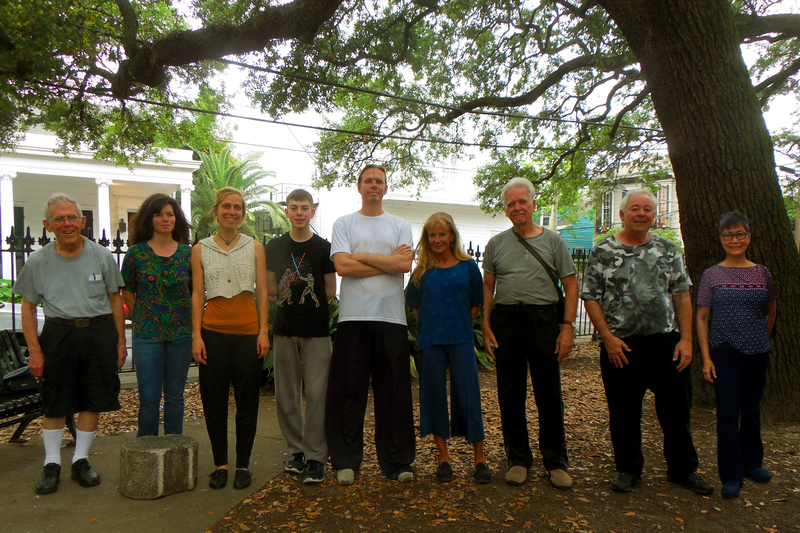 As Friday Sept 8 I will be available again, I will be available to teach at Freret Street Yoga from 1 PM till 8 PM. At least I’ll give it a try! I am not sure I am up to the long days, but Megabus changed their schedule again and all that is available is the 25 hour days. And so keeping in mind what Banksy wrote on a wall someplace, “If you get tired, learn to rest, not to quit,” I’m going to give it a try. I ride the Megabus every Friday to New Orleans, leaving at 4 AM. I have been taking the bus back at 4 PM until recently, but it has been discontinued. The next bus after that is at 10:30 PM, which would get me to bed at 1:30 or 2. 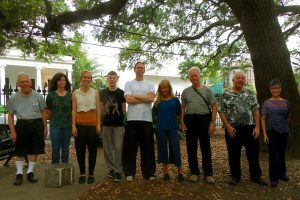 Since I am not up to 25 hour days any more, at least on a regular basis, I will not be teaching the Alexander Technique in New Orleans until further notice. This is a spontaneous monument by an anonymous artist “Dedicated to Every Cyclist in New Orleans Killed or Injured by Motorists.” The city tried taking it down the day before I took this but only got two bikes. They say it is unauthorized! Aedh had his bike stolen from a locked back yard courtyard with 8 ft walls recently. They even took the chain that he had it locked to the tree with! But, nobody steals the ghost bikes, the memorials all over the city to cyclists killed by motorists. 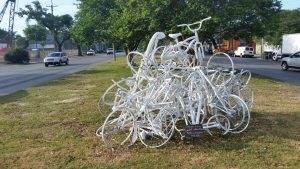 I did not realize this a world wide phenomenon, the ghost bike memorials, but I know the terrible crime rate is not world wide. Aedh thinks it is superstition that protects them. I call it respect, but whatever you call it, I am impressed! I just spent an hour and a half in the dentist’s chair getting a temporary crown to replace my broken tooth. It was entirely natural to say to myself, “I’m not tightening my neck…” etc. When I noticed I was curling my toes, I used it with my toes, and when I noticed clenched hands, I thought ” I’m not tightening my hands,” and they released! The neck direction almost always got a release of my shoulders, which I did not realize I was raising! I have to say recovery is going a lot quicker than when I come home totally exhausted from my usual stiff as a board position in the chair! I have tried using positive directions in such situations and it never worked for me. I find the negative directions work! They are intuitive and simple and that makes them vastly more useful. I tried recently to translate negative directions into positive directions, and just couldn’t come up with easy equivalents. It was obvious to me immediately after I started saying “I’m not tightening my neck,” to say “I am not tightening my jaw” whenever I found my teeth touching each other, which was frequently. When my tongue got so terribly sore from biting it in my sleep I added, “not tensing my tongue”, and it seemed obvious after that to go with “not tensing my face.” (Which reminds me of a tai chi workshop in 1978 when Ben Lo was telling everybody to “relax” and he came up to me and said “relax your face!” Not a new problem!) These all seemed easy to figure out, intuitive and effective directions. And I do not see the point of trying to translate them to less intuitive forms. But I can’t help but notice that in classical AT teaching there is a procedure which incorporates all these factors elegantly and effectively. It’s called the whispered Ah! It is a favorite of mine and I am not sure why I do not practice and teach it more but I suspect it is the difficulty I have relaxing my face which is mediated thru the little smile at the thought of something silly. So for now, on a day to day basis it is negative directions with the thought of more whispered Ahs in my future. I’m a little bit leery about discussing these outside a lesson but I think they are important and it’s worth the chance. Besides, it’s Halloween! I think each deserves a separate posting, but here’s a tentative list. The first one we don’t talk about is intimacy, a deep psycho-physical intimacy involving gentle touch and a psychic connection. The second is the AT hangover. The third is that in AT we develop muscles. Finally, for this tentative list, is the emotional and spiritual growth that occurs.